Commercial fishing for scallops has been part of the Victorian fishing industry since the early 1970's. 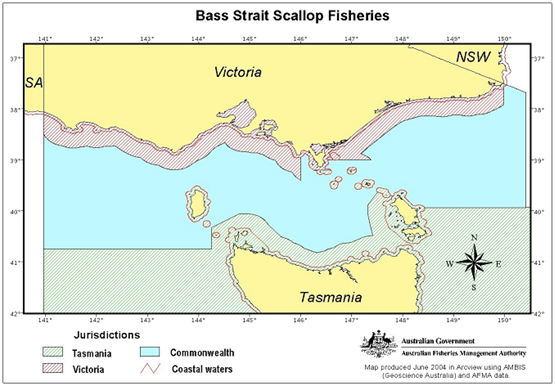 In 1986, management of the Bass Strait Scallop Fishery was split between the Commonwealth, Tasmania and Victoria under an Offshore Constitutional Settlement (OCS). Through the OCS, three zones emerged: the Commonwealth central zone, a Victorian zone and a Tasmanian zone. The waters of the Victorian zone extend out to 20 nautical miles from the high tide water mark, but exclude the bays and inlets along the coast where commercial fishing for scallops is prohibited. The fishery is characterised by highly variable catches due to severe fluctuations in the resource. In some years, there are so few scallops that fishing cannot take place as it would put undue pressure on stocks and threaten the long-term survival of the stock and fishery. Fishery Overview details the Victorian Scallop Fishery, including species information, fishery location, fishing method, management arrangements and fishery statistics. An abundance survey was undertaken for the eastern Victorian ocean scallop fishery over the months of December 2017 and January 2018. This is the first abundance survey to take place in the fishery since 2012 over which time very little fishing effort has occurred. The Total Allowable Commercial Catch (TACC) was set at zero tonnes for the 2010/11, 2011/12 and 2013/14 seasons due to the stock assessment surveys in 2009 and 2012 finding that the fishery was neither commercially nor biologically viable. The TACC has remained at a low level of 135 tonne since 2014/15 to allow exploratory fishing to occur. Results from the 2017/18 abundance survey have indicated a continued low level of abundance and recruitment throughout the fishery. The survey did locate a very small number of beds containing commercially available scallops, however they were not at a level or density considered sufficient to increase the TACC from the current level. The Eastern Victorian Ocean Scallop Abundance Survey final report can be viewed here. The Victorian Scallop Fishery is based on the species, Pecten Fumatus. Occasionally, incidental catches of doughboy scallops (Chlamys asperrimus) are taken as by-product, but are generally not in commercial quantities. Scallops mature after one year but do not spawn until the second year. Adult scallops normally spawn between late winter and early spring. Larval scallops drift as plankton for up to six weeks before first settlement. They attach to a hard surface such as seaweed or mussel and oyster shells and remain attached until reaching around 6mm in length. The small scallops then detach themselves and settle into sediments and bury in so that only the top flat shell is visible. The juvenile scallops grow quickly and reach marketable size within 18 months. The Victorian Scallop Fishery is one of three scallop zones in the Bass Strait, and extends out from the coastline to 20 nautical miles. The same arrangement is in place in Tasmania and the area of water between the two state zones is managed by the Commonwealth Government (see Figure 1, courtesy of the Australian Fisheries Management Authority). The current boundaries were settled in 1986 with an Offshore Constitutional Settlement agreed between the three jurisdictions. 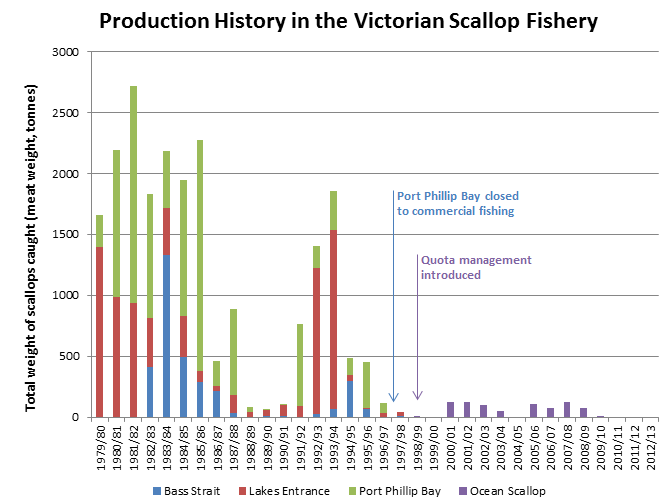 A commercial scallop fishery also operated in Port Phillip Bay until 1997 when it was closed to commercial operators. The area has remained accessible to recreational fishers. Commercial fishing for scallops is by dredging; vessels tow a single dredge that is dragged along the seabed. Dredges are deployed from the rear of the vessel and are up to 4.5 metres wide. A tooth-bar on the bottom of the mouth of the dredge lifts scallops from the seafloor and into the dredge baskets. To participate in the Scallop Fishery, fishers must possess a Victorian Scallop (Ocean) Fishery Access Licence. The number of licences has been capped at 91, and approximately 10-15 boats operate in the fishery. The majority of active operators in this fishery also possess entitlements to fish in Commonwealth waters. The fishery is primarily an output controlled fishery that has been under Individual Transferrable Quota arrangements since 1998. Quota is set annually and each licence holder is given an equal share at the beginning of each season. Scallop quota is transferable amongst licence holders. The fishery has historically been open continuously throughout the year, with most recent the fishing season commencing on 1 April. Minimum size: currently, scallops taken must be more than 80mm wide when measured in a straight line at the widest point across the shell. Discard rate: to protect juvenile stock, fishing areas can be closed if more than 20% of the scallops in the catch are below the minimum size limit. Under a Code of Practice developed by commercial fishers and The Victorian Fisheries Authority, when juvenile beds of scallops are identified, GPS coordinates are used to establish spatial zones that are not fished. Meat per kilogram: also under the Code of Practice is a further management control designed to ensure the quality of the product and to enhance commercial returns; if the average number of individual scallop meats (adductor muscle) is more than 100 per kilogram, the fishery can be closed until the quality of the scallops improves. In response to falling catch rates, the stock abundance in the fishery was surveyed in 2009 and 2012. Both surveys revealed very low densities of scallops throughout the traditionally fished areas of the fishery. Consequently, no quota was made available between 2010 and 2013. A small and conservative amount of quota was granted for the current (2013/14) season to allow limited exploratory fishing to take place to determine if there had been any recovery in the stocks. Results are pending. Scallop abundance is naturally highly variable causing catches to fluctuate widely from season to season. Since the beginning of the commercial fishery in the 1970's, catches have varied from tens of tonnes to thousands of tonnes (Figure 1). Catch rates, and therefore stock abundance, declined in the mid- to late 2000's, and surveys of scallop grounds conducted in 2009 and 2012 revealed a lack of commercial quantities of scallops. In response, quotas of zero were put in place for the 2010/11, 2011/12 and 2012/13 seasons. Figure 1: Time series of catch (meat weight, tonnes) in the Victorian Scallop Fishery. Port Phillip Bay was closed to commercial fishing in 1997, and in 1998 the licences for Bass strait and Lakes Entrance were combined to be called 'Ocean Scallop'. When open, the fishery is managed using a quota management system of individual transferable quota. Annual consultation is undertaken to determine the total allowable catch (TAC) and is based on a combination of stock survey analysis and scientific and industry expertise. After consultation, Fisheries Victoria, on behalf of the Minister for Agriculture and Food Security, then sets the TAC via a Quota Notice and distributes the quota equally amongst the licences.